An evening of The Carmen Online Theater Group's Chronicles of Terror. 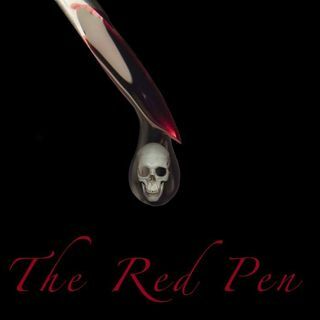 Tonight's presentation is, The Red Pen, an original horror story written by Olga Werby, narrated by and starring Anthony Webster. Produced by Liane Moonraven. I really enjoyed this story. This was like real classic old fashioned radio story telling. Love the almost Welsh narration. Thanks so much David and I do hope to see you again. Are we following each other on FB too? I'm signing off. But I'm a follower now! you have a tough job though sir! No, I'm just an editor. hahahaha!!! good stuff. Do you write as well? My wife's name is Stephanie, and I do own a cursed pen that feeds on my soul. But everything else is totally made up. Okay everyone, we're out now. We both absolutely loved this story!!! would love have you come by again.